I love simplicity. When I established Hermit’s Rest in ‘97 the lifestyle demanded simplicity and I embraced it. I even decided to find out just how simple simple could get, The Hindu holy men that sit naked in the temple alcoves with nothing but a mat, begging bowl and water cup are the practitioners of quintessential simplicity, however I’m not in India. Such behavior is frowned on here in the states so I had to compromise. Simplicity is based on minimalism. I asked myself what do I really need to live a comfortable and sanitary life. 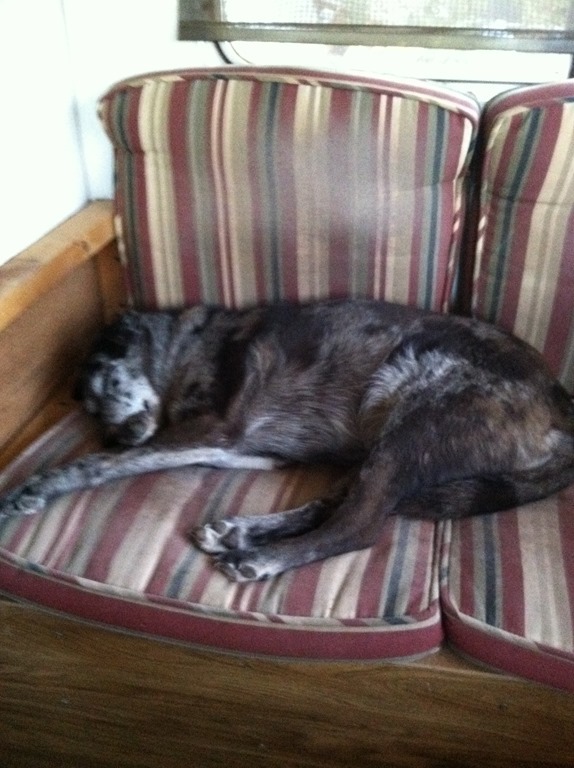 For the first 17 years I lived alone with my Queensland Heeler ‘Gabbie’ who was perfectly content with a water bowl, food bowl and sleeping bench I made her, she was essentially a Hindu Siddha without the temple alcove. I also didn’t have much money because I gave my medical engineering practice in California to a colleague of mine and retired at 48. I decided having all the time in the world to spend was a richer and simpler life than having a stack of money to spend. I spent the first 22 years of my life dirt poor and didn’t become a successful engineer until I was 27. I went from being a hippie living in an old converted chicken coop with a yearly income of $720.00 dollars a year and a beat up ‘58 Ford pickup to a yuppie with a hillside home and Porsche. At the height of my silliness to overcome a life of poverty and try out social acceptance and success I wound up buying the restaurant where I had been the janitor 8 years before (the source of my hippie $720.00 a year income) and owning a Mercedes a BMW another restaurant and was working 120 hours a week. Two things saved me. One of my regular customers at the restaurant who was living in his VW bus asked me how much the Mercedes was costing me a month, I told him with payments, insurance, yearly registration and maintenance probably around $600.00 a month. He responded with “Hell Mike you only drive it to and from work. I’ll come pick you up and take you home for a hundred a month.” I bought him breakfast and he never had to pay for his coffee again, cheap price to pay for the wisdom of common sense. The other major influence was Paul Simons song, “Slip sliding away.” The lyrics “The closer you’re destination the more you slip slid away” hit the soul of my true self like a hammer. A year later I walked away from everything, bought an old motorhome and headed for the Arizona wilderness. My income dropped from $130,000 a year to $7,920 but my time account soared to unlimited heights and the elation experienced in freeing myself from all of the social trappings, along with returning to my true nature, made the adjustment easy. When the only person you’re accountable to is your dog it leaves you with a lot of leeway in lifestyle choices. I bought my property for a hundred dollars down and seventy-five dollars a month for eight years. The next step was to drive a hundred miles to the nearest city and trade the motorhome for a 1986 four wheel drive pickup with a six inch lift and 33” all terrain tires to navigate the unpaved roads. 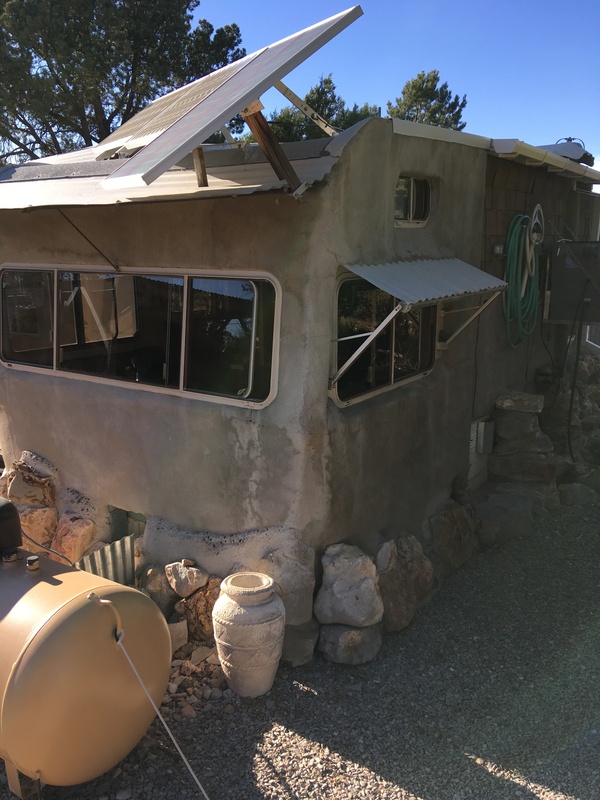 To replace the motorhome I bought an old twenty-four foot travel trailer, moved it on the property and covered it in concrete to keep it from falling apart as well as creating a trombe wall effect for passive solar heating and insulation. Three years later I saved up enough money to build an eighty square foot front room for reading, writing and whittling. I added large windows for the view which brings the outside in. The place may look a bit odd but it’s efficient, comfortable, easy to heat, keep cool and maintain. The total cost was $4,800. Three years ago I somehow managed to find a woman who found my company tolerable and this lifestyle had always been her dream. The post “Hide and watch” talks about how that remarkable event occurred. The house is 240 square feet that we find more than adequate. Over the years and as I got older I allowed myself a few comforts. 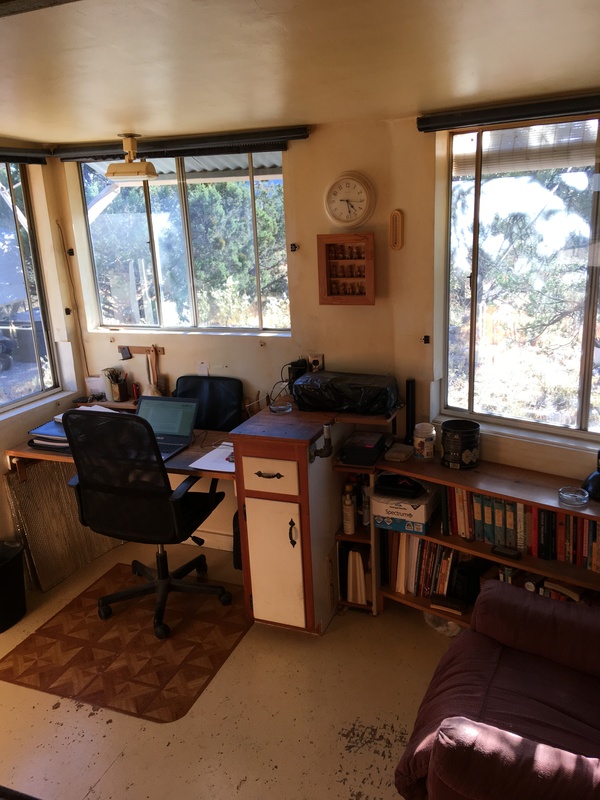 A composting toilet and I expanded the 65 watt solar system to 175 watts to run a laptop and small 12 volt refrigerator that’s about the size of a large ice chest. The place is still run off of just two 6 volt deep cycle golf cart batteries. Due to the open floor plan and it’s size our primary light source is a 4 watt LED ceiling fixture. We use an average of 350 watts of 12 volt electricity in 24 hours, that’s with the refrigerator, lighting, laptop and a 12 volt DVD player for a movie at night. We have 2,300 gallons of water hauled in once a year and stored in two large tanks. We’ve found if used conscientiously 6 gallons of water a day is adequate for drinking, cooking, bathing and the hand washing of clothes. 85 gallons of propane is delivered twice a year and in the winter it can average 20 degrees at night and 40 degrees during the day with the occasional below zero at night and 20 during the day. Once again the size of the place and simple passive solar heating help. We don’t require much in the way of things other than basic supplies so we drive an average of 1,680 to 2,000 miles a year which allows us to spend time at home watching the wonderment of our natural surroundings and listening to the whispers of nature. This lifestyle isn’t for everyone, and rightfully so, it has it’s challenges, and family obligations are a factor. I’ve posted this simply to show those who might feel trapped in a dead end life that what you get yourself into can always be backed out of and it doesn’t require much money. Simply a conviction that if you point your toes in the right direction all you have to do is start walking. Next > The Monk #1. Mike and Lori, a time is fast approaching when we’ll have no other choice but to live simply. You demonstrate that it’s possible. Absolutely Rosaliene, I agree the time is fast approaching when the choice to live with less won’t be an option it will be a requirement. It’s going to be a difficult transition for many. Recently I been thinking there will be a time when even Lori and I will have to make adjustments. I love this. I read it thinking “one day” but I don’t know what stops me from turning “one day” into “today.” Fear, likely. Societal norms. There’s so many excuses to get past. But it’s great how much dogs can teach us by just being themselves. Hey don’t feel bad my friend, it took me 48 years. And you got it, Gabbie was my guru. You’re welcome jkaybay. Indeed we unfold as we go.